In this installment of Lost Knowledge, we look at the arcane arts of homebrewing your own electronic components. This column was inspired by Collin’s experiments with light-emitting diodes in his Make presents the LED video (see below). I thought it might be fun to collect some of the other homebrew component projects we’ve covered here on MAKE and that I could find elsewhere. This is far from comprehensive. If you know of other cool projects of this nature, please add links in the Comments. 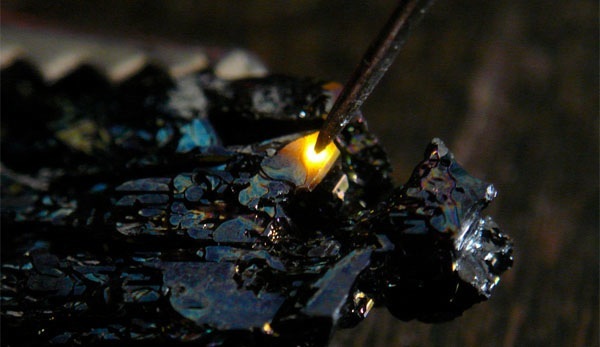 Collin’s experiments with light-emitting properties in silicon carbide for his LED episode of Make presents. Science and tech enthusiast Nyle Steiner’s page detailing his experiments in building a negative resistance oscillator using a homemade tunnel diode. Another diode experiment from Nyle Steiner, a homemade vacuum tube diode. This is a follow up experiment from the report that I wrote previously about home evacuation of a vacuum tube. The next step is to make my own vacuum tube from scratch. This is my first attempt, a diode. The diode seems to work surprisingly well and makes the thought of putting a grid between the filament and the plate very encouraging. The undisputed king of homebrewed retro componentry is France’s Claude Paillard and his made-from-scratch triodes. This guy is like some Franco-geek national treasure. His site is in French, but there’s a link to Google Translation (for what that’s worth). We’ve posted this video several times already, but it’s worth posting again for anyone who missed it. The National High Magnetic Field Lab has several interactive tutorials of Leyden jars, capacitors, and voltaic piles. 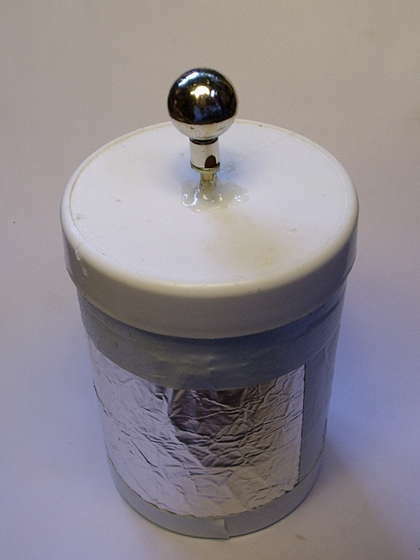 A simple salt water Leyden jar from Instructables we featured here on the site last year. Group description: In 1954 an article in Short Wave Magazine in Britain described to readers how they could make their own transistors. This idea has been revived in recent years, thanks to the books of Pete Friedrich (The Voice Of the Crystal and Instruments Of Amplification), and later in 2008 the original SWM article of 1954 is due to be updated in the UK magazine Practical Wireless. This group is intended to aid would be transistor manufacturers at home, as a place to post problems, and, hopefully, solutions. Article from a 1955 issue of Radio Constructor magazine. A classic. Nyle Steiner’s experiments in Zinc-based negative resistance oscillators. Success with this experiment has been a very exciting experience for me as it represents the ability to build a simple homemade active semiconductor device. It is almost like making your own homemade transistor. This is an actual realization of some very old and esoteric 1920s experiments, by W.H. Eccles, Greenleaf Pickard and Oleg Losev, that were so vaguely reported in a few articles that I have often wondered if in fact it had actually been done. Even so, I have always had an extreme fascination with those reports of being able to produce a continuous wave RF signal from a crude semiconductor material back in the very early days of radio. This instrument, called a “boom” detector, is featured in the book. It’s comprised of various pieces of brass, including a gas fitting from which the crystal cup is fashioned. The crystal semiconductor material, in this case, is iron pyrite. I call this instrument a “crank coil.” To be precise, it’s a double-tapped adjustable tuning inductance, which utilizes a novel arrangement of screw threads to allow precise positioning of the coil taps. Construction details for this coil appear in the book. Headphones are one of those parts that “experts” tell you can’t be fabricated at home using hand tools. Well, here’s yet another headphone design using scrap magnets and coils of wire wound upon cardboard spools. The floor of a mushroom can is utilized as a diaphragm. The rear cover of the instrument is a die-cast fence post cap. Whenever the subject of homebrewed retro components comes up, H. P. Friedrichs usually comes with it. His books, Voice of the Crystal and Instruments Of Amplification are venerated amongst many component makers and crystal radio builders. In these two books, and on his site, he shows you how to build various radio components, coils, tubes, transistors, and other components. His builds are often as beautiful as they are educational. Most of what’s on the site are photo galleries, teaser material for the books, but there are some cool projects too, like how to build a headphone out of a tea tin, and a bunch of PDFs of vintage radio articles. Jeff Duntemann’s Homebrew Radio Gallery shows off and describes his collection of homemade tube radios. Nyle, one last time, here playing around with different ideas for construction of cathode ray tubes. Especially check out his discharge tube made into an electron gun. Every now and then, something from the first television boom period (1928-1932) turns up. More often than not, it was built by an experimenter of the day and used for tuning in the magical television signals being broadcast here and abroad. It was a fascinating time for experimenters. The experimentation continues to this day and those of us involved experience the same thrills and disappointments as did the television pioneers so many years ago. It is fascinating to watch and witness in our time, the same reactions that occurred some 75 years ago. Check out MAKE, Volume 17: The Lost Knowledge issue! In Volume 17, MAKE goes really old school with the Lost Knowledge issue, featuring projects and articles covering the steampunk scene — makers creating their own alternative Victorian world through modified computers, phones, cars, costumes, and other fantastic creations. Projects include an elegant Wimshurst Influence Machine (an electrostatic generator built entirely from Home Depot parts), a Florence Siphon coffee brewer, and a teacup-powered Stirling engine. This special section also covers watchmaking, letterpress printing, the early multimedia art of William Blake, and other wondrous and lost (or fading) pre-20th-century technologies.